If you’re a cat person, you’re probably used to wearing their hair on your clothes, so why not rock the look by turning their fur into finery? Kate Benjamin of Moderncat celebrated National Hairball Awareness Day on Friday by commissioning jewelry designer Heidi Abrahamson to transmute her kitties’ shed locks into earrings, a necklace, and a cocktail ring. The good news is that Benjamin didn’t wait for her furry friends to spit up their follicles; she used a grooming tool known as the Furminator to gather the material she needed. 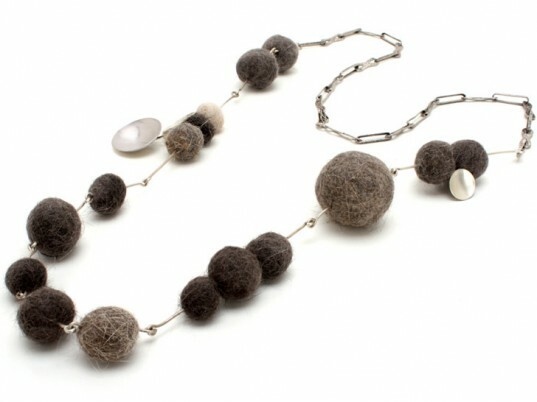 Rolling the fur between her palms, Benjamin felted the strands into tight, solid beads, which Abrahamson then strung up on sterling silver. “If you’re going to wear cat fur, why not be fashionable about it?” asks Benjamin on her blog. “If you’re going to wear cat fur, why not be fashionable about it?” asks Benjamin on her blog. Modeled by Justine Nations, the accessories are a true testament to wanting your cat around you 24/7. If you’re champing at the bit for a custom set of your own, contact Abrahamson for pricing and other details. I always make fur balls just like this after our fur appointments; and thought I was alone / insane for twisting kitty fur into rings to be kept as mementos. I love this idea--especially since the fur balls fall a little lower so they might not itch the skin. Even I wouldn't do this. I don't know about jewelry, but when my dear kitty died last fall, I needle-felted a picture of him. For whiskers, I used the whiskers he had occasionally dropped around the house. Friends have commented that they thought that it was actually my kitty, come to life again. If you're a cat person, you're probably used to wearing their hair on your clothes, so why not rock the look by turning their fur into finery?�Kate Benjamin of Moderncat celebrated National Hairball Awareness Day on Friday by commissioning jewelry designer Heidi Abrahamson to transmute her kitties' shed locks into earrings, a necklace, and a cocktail ring.